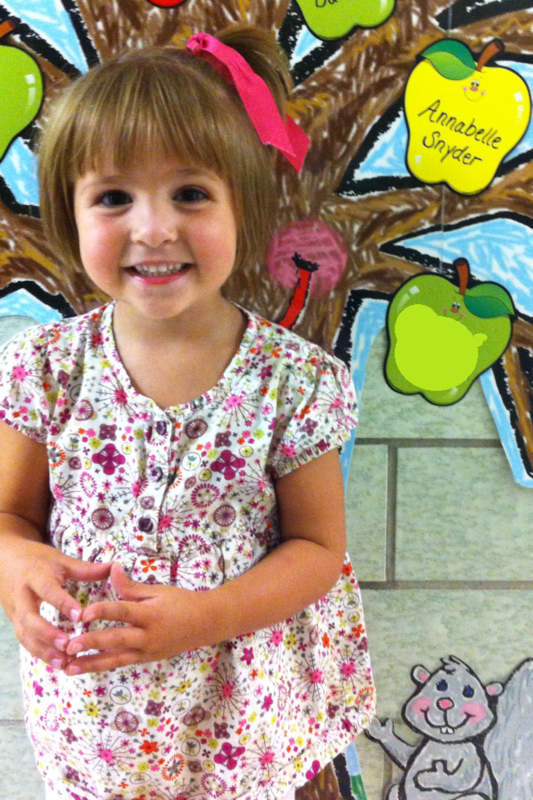 Last night was Boo’s parent orientation for preschool. We’ve done this, before, with the boys, but this time it was different. I sat with a rock in my stomach. It is the time that our youngest is starting school, but it’s not our youngest. We shouldn’t be “here” yet. I couldn’t think about it. I pushed those thoughts out of my head, for a little while. I want to celebrate Boo (she is SO excited about school). She looks so happy! She is going to love it! I just dropped Claire off at Kindergarten for the first time. It’s also the first time in 11 years I will be home with no kids for an entire school day…it’s a little weird. I hope you will find some time to do some things for yourself while your kids are in school …it’s YOUR turn too. Love You! …but imagine all the wonderfully amazing things that your Lulu Grace is learning in her heavenly school above, from the BEST teacher in all creation! Continued love and prayers to you all! Such a adorable pic!! I love the lil apple with her name on it.